The filtered photo war is on. Instagram announced Sunday that it was no longer supporting embedded photos on Twitter, but Twitter isn't sitting still when it comes to photo sharing. This evening Twitter's updated its Android and iPhone apps with features that allow you to add filters to photos directly from the app. No need to do it through Instagram anymore. There are eight filters to choose from - including, Warm, Cool, Vintage, Happy and Cinematic - as well as cropping and brightening functions. The photo filters, using technology made by Aviary (not Twitter), will be added to the Twitter app when you download the update. I played around with the app and found it easy to use. You can also easily see your photos with the filters in a grid, which makes it easier to decide which filter you'd like to use. 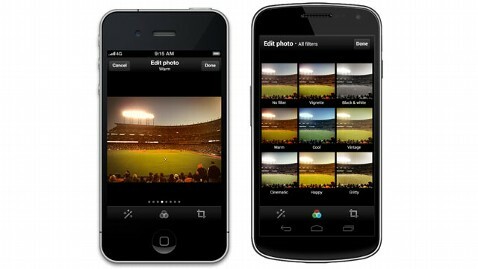 Instagram still offers a more robust set of features, though, especially with its blurring tool. Coincidentally, Instagram also released an update for its iOS app today, which adds the ability to crop and scale photos. Instagram's CEO said that the decision to drop Twitter embedding support was about sending people to Instagram's own site - but it so happens that Facebook acquired Instagram in April. "This is likely the result of the Facebook acquisition, as it makes little sense for Facebook to send Instagram pictures to Twitter," Michael Gartenberg, research director at Gartner Inc., told ABC News earlier today. Still, it is easy to see why Twitter has added the functionality to its own app. Instagram has over 100 million users and on Thanksgiving alone over 10 million photos were uploaded. Bottom line? You can now filter your photos on Twitter, but you can't filter the social photo sharing war.